It’s no secret that I am a fan of Thai desserts and working out of mama’s magic kitchen again, I owe it to myself to just go for it! 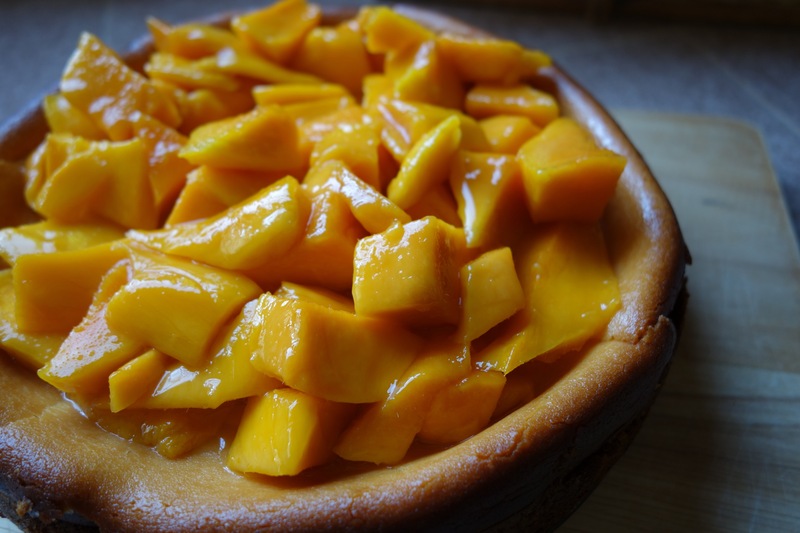 The result is…A rich almost sinful cheesecake, and for mama, the perfect mango twist. Pour and press into the bottom of an 8”spring loaded pan. Remove from oven. Leave oven at 350 for cheesecake. 2 8oz. packages of cream cheese-room temp. Combine cream cheese, Marscapone cheese, sugar, flour and a pinch of sea salt. Mix at medium speed until well blended. Add eggs one at a time mixing well after each addition. Blend in vanilla and coconut extract. Pour filling over baked crust and smooth out evenly. Return to oven and bake for 60-70 minutes. Remove from oven and let cool completely. Remove from pan set on serving plate. 2 mangoes peeled and sliced. Set aside. Bring 1/4 cup water, 1 teaspoon lemon juice, and 1/4 cup sugar to a simmer in a small saucepan, whisking until sugar has dissolved. Pour over mangoes and macerate until ready to serve. You can make this in advance. If you do, keep it in the refrigerator until just before serving. 1/2 cup water and 1/2 cup sugar. And still the 1 teaspoon of lemon juice. I like to spoon the mangoes over the top cheesecake before serving, this makes a beautiful dessert but if you like you can serve mango compote individually over a generous slice of coconut cheesecake instead. Eaton Square Edible on Facebook!